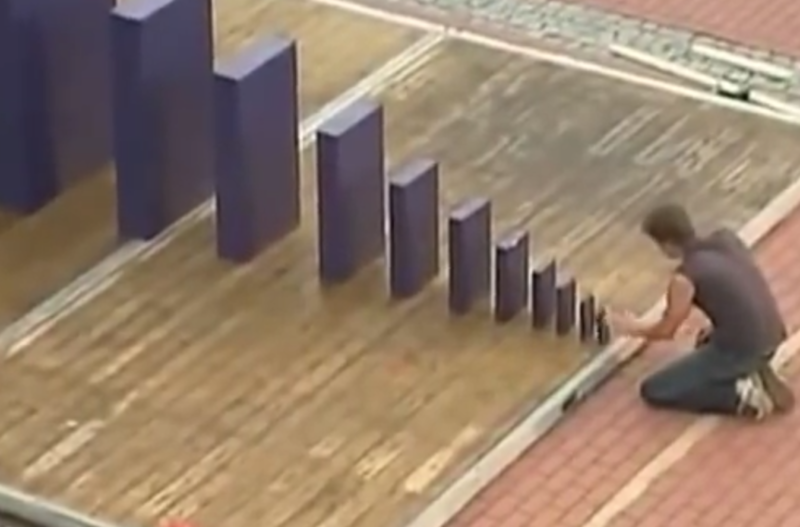 The Blog Domino chain reactions: How little nudges become big sales. Scientists have measured the power of a falling domino, which, turns out, can knock over a domino 1.5 times its size. That means a two-inch tall domino can start a chain reaction that knocks over an adult human with just nine dominos. The moral? All hail the little nudge. People who visit your website may just be window shopping. They may even be at your site by mistake! But once they’re there, they’re an opportunity to start, if not a negotiation, then at least a conversation. In our previous article, we discussed how online behaviors are full of little tells that present you opportunities to evolve your relationship with a potential customer. It doesn’t take much to move the needle. Just a nudge. Maybe you nudge them as they’re about to leave your site with a low-stock warning. Recontextualize information on your site with new urgency, and they may reconsider leaving so quickly. Perhaps you offer them updates on new products in exchange for their email. No big commitments, just a nudge here. A nudge there. Except now the nudge has moved this potential customer into a conversation that provides opportunities for other nudges. Perhaps you alert them in an email to a sale. Perhaps, if they return to the site, you remind them of products they last showed interest in. Your nudges inspire new behaviors that reveal new opportunities to move the potential customer down your conversion funnel, until one day, they make their first purchase. Might checkout be a good time to mention other products you sell that complement the product they’re buying? Might you mention how the additional purchases will raise the total purchase price high enough to earn the customer free shipping? Now the customer happily increases their cart total, raising your average profit per visitor, all thanks to that first, little nudge. One tiny domino can land a lifetime-loyal customer. It’s science. But how can you nudge hundreds of thousands of people instantly at the right moments with the right information to maximize your conversions? Easy: You work with us. Our mission and passion are to help our customers perfect their conversion funnels through the power of tells and nudges. This is better known as behavioral marketing, and we have been a trailblazer in the field, inventing many of the techniques now used by imitators, while devoting our resources to new and better ways to sway shoppers into becoming buyers.